Originally opened in 1650, this 4* hotel now features stylish contemporary interiors and a restaurant serving delicious seasonal cuisine. This historic city is famous for its medieval architecture, luxury shopping and great restaurants. We've included a complimentary glass of wine with your dinner, and if you stay 2 nights we'll treat you to a delicious Cream Tea too! 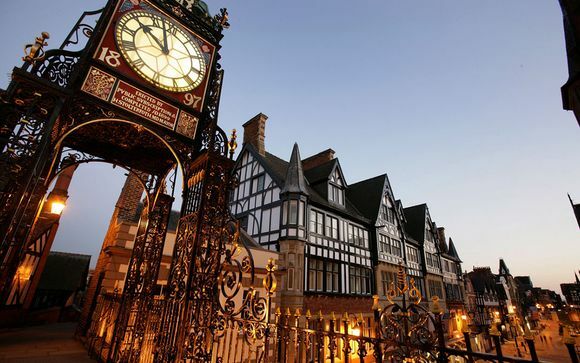 Your hotel is situated in the heart of the historic City of Chester, near the Eastgate Clock Tower - the city's famous emblem. This is the perfect location to explore Chester's historic attractions such as The Rows and City Walls. A 15 minute drive will take you to Chester Oaks Designer Outlet or Chester Zoo. Built by the Romans on the borders of England and Wales, Chester has welcomed visitors for centuries. You can still walk the ancient city walls, to catch a glimpse of the largest Roman amphitheatre in Britain and admire the architectural beauty of Chester Cathedral. This historic city is renowned for its striking black and white half timbered buildings which include the medieval ‘Rows’, full of shops, restaurants and bars. A cruise on the River Dee is a delightful way to see the city in the warmer months. 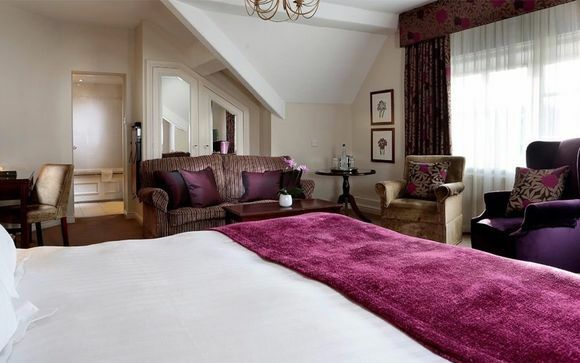 This smart 4* hotel offers a comfortable base for your weekend in Chester, right in the city centre. originally opened in 1650 this histroic hotel blends period charm with contemporary interiors and services. Each of the 67 bedrooms is individually designed, for a unique ans stylish feel. The restaurant pays homage to the hotel's past, being named the 1650 St Johns Restaurant, and serves delicious seasonal fare and great cocktails. Spacious and stylish Executive bedrooms feature a super king-sized bed with mattress topper and the finest cotton sheets, so you can be assured of a great night's sleep. Amenities include: a Nespresso coffee machine, a music docking station, fluffy bathrobe and slippers, free water and Arran Aromatic toiletries. Our members can enjoy daily breakfast plus dinner on the first night. Just for you: A glass of house wine each with dinner. This relaxed and friendly restaurant serves simple yet delicious dishes, with a focus on fresh fish and steaks. Ingredients are seasonal and British wherever possible, such as the finest Scottish beef, Scottish lamb and wild white fish, as well as an ever-growing range of organic ingredients. Take advantage of the 2-4-1 cocktails and half price sparkling wine and Champagne every Thursday! Your hotel is 0.7 miles from Chester Station and 25.6 miles from Liverpool Airport. Parking is available at the Grosvenor Shopping Centre car park, Newgate Street, CH1 1DE. (£10 per 24 hours). To drop luggage off, use Sat Nav Postcode CH1 2HJ to take you to the city barrier, give your name and follow the one way system to St John Street.